NAF Canine Omega Oil is a balanced blend of superior natural oils to support healthy, vitality, joint flexibility and a silky, glossy coat. Made with a unique blend of soya, linseed and hemp oils, NAF Canine Omega Oil provides the ultimate blend of Omega 3, 6 and 9 fatty acids in a convenient and economical form. 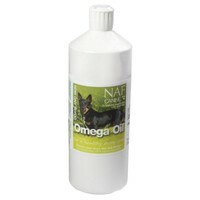 Used regularly NAF Omega Oil will enhance your dog’s diet, and improve their overall lifestyle.